10 Books about Women Role Models to Inspire Young Minds, presented by the YWCA Montreal. 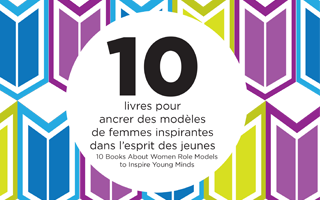 To celebrate 2016’s International Women’s Day, the YWCA Montreal presents Ten Books about Women Role Models to Inspire Young Minds. This list of illustrated books has been compiled by the organization’s Youth Services team for 3 to 16 year olds. Parents, friends and educators are invited to instill the idea in both girls and boys that women have control of their destinies and have accomplished great things throughout history.